The Fabaceaen Order of the Hip Pouch is for everyone who plays the autoharp supported by a hip pouch filled with peanuts in the shell (or related material) to support it, and for those eager to give it a try. This page explains how to set up and use the hip pouch to play the autoharp easily, along with nutty facts about the Order that will make you smile. Feel free to contact me with your hip-pouch success stories, any set-up needs you have beyond what’s on this page, or other information you would like to know. Many thanks to Ed Cryer of Lancashire, England and part of the Latin Group at Google Groups, for his expert classical Latin translations! Meet Chloe, whose mother is autoharpist and B&B student June Fessenden of Phoenix, Arizona. June hosted the Grand Hippee at her home in February 2015 while the GH presented a round of autoharp workshops and a concert in the area. 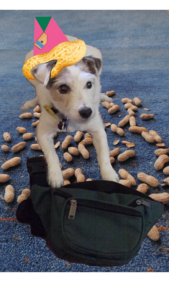 While they were out to dinner one evening, Chloe was enticed by the smell of peanuts wafting from the GH’s unprotected hip pouch and worked her way in to play with the stuff. Who better to be the Order’s Mascot? Already using a hip pouch? Help spread its joy far and wide by joining the Order and being accounted for in The Peanut Gallery on the map below! It’s free, it’s fun, and you’ll also be the first to know about new hip-pouch developments as they occur. You say the hip pouch is unnecessary but you support the Order’s cause? (Because, say, you happily play the autoharp flat on your lap, or you don’t play the autoharp but use a hip pouch to carry your wallet keys, etc. ), you can join the Order as a Friend, which entitles you to a pin as well. Click here to get a pin! Note: Each pin appears over the name of your town, or over your residential district within a large city. Click and drag the map with a mouse, or press and drag on your mobile device screen, to center the region you want to view within the map’s boundaries. Then zoom in to easily click or tap on individual pins and see who’s who. To make a request to have a pin placed on the map for you, click here. During a Body Mapping class at Westminster Choir College in June 2006, I pondered a way to steady the autoharp at an ergonomic height. My first try was crude: I stacked two books on my lap that together provided the necessary height. It was a struggle to balance the autoharp on top of flat, slippery books and play at the same time, but I felt like I was on the trail. Once home after the Body Mapping class, I stuck several 2″x 3″ pieces of sticky-backed, 1/8″-thick foam sheets together to fashion a lightweight, barely compressible chunk that would raise the autoharp off my lap and feel comfortable. Every time I began to play, the autoharp sat on the foam for a few seconds and then rolled the chunk over and landed on my thigh. Back to the drawing board. At the end of July 2006, I flew to Portland, Oregon to perform an autoharp concert and do a little sightseeing before moving on to the now-defunct Willamette Valley Autoharp Gathering (replaced in 2014 by the Northwest Autoharp Gathering). Still curious about an ergonomic, autoharp-balancing device, I acted upon something I’d seen years before in an old issue of the also-defunct “Autoharpoholic” magazine: I threaded an old necktie through the cardboard tube inside a roll of (organic!) toilet tissue and tied it around my waist. Then I parked the autoharp on the roll and began to practice for that evening’s concert. The tissue roll wouldn’t cooperate and the autoharp refused to sit on it nicely, even with the cardboard tube flattened. Frustrated and wondering if there even was a solution, I happened to glance at the table to my left where my hip pouch, containing wallet, etc. inside, lay. Hmmm…. I put the hip pouch on and played. It needed just a touch of belt loosening to make it work really well! It was a no-brainer to perform the concert with it that evening. And I’ve been using the hip pouch ever since. Every time I drive to a festival where autoharpists are likely to appear, I bring a tote bag full of hip pouches to lend. Today, more and more autoharpists are using the hip pouch. The concept is going bananas–I mean, nuts! What follows relates to playing the autoharp upright against the chest. The hip pouch raises the autoharp about four inches (plus or minus, depending on its size), helping the autoharpist surround both arms completely around the autoharp and play it without also supporting it with the arms. Before you purchase a more narrow autoharp, park a normal-sized autoharp atop a hip pouch; instructions appear in the next section. The hip pouch supports the autoharp from underneath, not on a strap and hanging from the shoulders. Both entire arms, of which the shoulders are part, are free to access all strings and chord-bar buttons unencumbered. When sitting unanchored on the lap, the autoharp wants to slide forward and onto the floor. When wearing the hip pouch, the belt anchors the pouch, and the zipper tape on the lid catches the autoharp’s “lower treble corner.” The autoharp stays put. 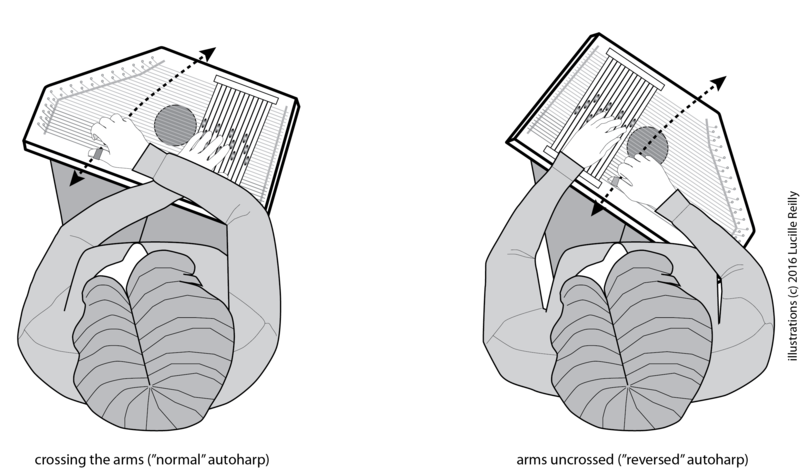 The hip pouch creates space between the autoharp and the player’s body, increasing resonance and volume (both magnify further when both forearms play off the autoharp). The hip pouch allows both feet to be on the floor when sitting to play. As someone who played the autoharp by crossing the left leg over the right (which some people cannot do) for 16 years, when I uncrossed my legs, all sort of tension that I didn’t know I had running up and down the entire right side of my body released. My string fingers gained effortless speed and increased endurance. In performance, there are no strap buttons to fuss with when switching autoharps, because there is no strap. Put one autoharp down, park the next autoharp atop the pouch and play. This set-up means you can use your arms solely to play the autoharp! Note: The autoharp must slant to the torso. It cannot be vertical, especially for a woman. Therefore, the pouch’s belt needs to be very loose, and the pouch portion must have some space between it and the body. If you already have all the materials, click here to jump to the Instructions. Avoid hip pouches with a zipper running straight across the top; the zipper tape on a curved lid provides a way for the autoharp’s lower treble corner to lodge against it. 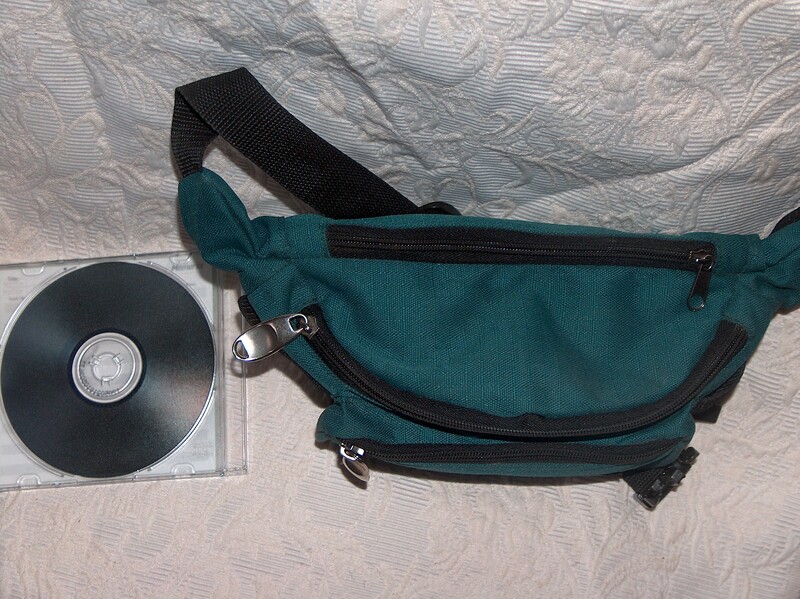 The pouch’s size needs to be “big enough.” Size is hard to describe, which is why a compact disk appears next to the hip pouch in the photo above. Some pouches are small; avoid these because they won’t be deep enough to raise the autoharp significantly off your lap. Don’t buy a huge pouch like those the birdwatchers use to hold their binoculars and birding books. A large pouch requires more peanuts, adding weight to the pouch; you might feel this on your back. The belt (minus the closure) needs to be long enough to completely surround your hips (not your waist). A couple extra inches can only help. If you can’t find a hip pouch with a belt that’s long enough, you can lengthen it by threading a generous piece of non-slippery rope or twine or an old necktie, through the “loops” securing each half of the closure. Tie both ends together with an overhand knot. Hip pouches can be tricky to find in retail stores. Check local thrift/charity shops for bargains. Thrift-shop prices in Denver, Colorado center around $2-3, vs. $20 and up in sporting-goods stores. Make sure your bargain is well constructed before you buy. One pound of peanuts in the shell: Real peanuts are lightweight and malleable, easily moved around from the outside of the pouch if you need to redistribute them. Large, dried legumes, like dried lima beans (just be sure the hip pouch stays dry inside and out). wine corks (these may work better when cut in half). Styrofoam peanuts do not work because they compress when the autoharp sits atop the pouch, shortening the autoharp’s height above the lap. Ditto for plastic grocery bags. A small plastic sack to hold the peanuts (optional): The shells break up over time, making the inside of the pouch “crumbly.” If you don’t care about crumbs inside, there is no need to put them in a sack. If you do care, dump the peanuts in a plastic sack about 10 x 12 inches in size; drug-store sacks for prescriptions and greeting cards hover around this size. Standard grocery-store sacks are too large and may cause the autoharp to sink lower when placed atop the pouch. Don’t twist or knot the sack closed, because you will adjust the amount of peanuts during set-up. If your local market sells pre-packaged, one-pound bags of peanuts in the shell, don’t shove the unopened bag in the pouch. There may be too many peanuts in the package, or not enough. You don’t know yet, so prepare for some adjustment here and open the package(s). It’s okay if the chair has a back. Just know that your back will not lean against it, especially if you are very tall. The seats of old piano stools, and painter’s or artist’s stools, spin around to adjust in height and may be a good option. The autoharp sits atop the hip pouch best when its “lower treble corner” comes to a point. If the lower treble corner’s shape is a large curve (present on some Oscar Schmidt-International autoharp models built from 1963-1978, beginning with model #12; see illustration at right), it may take a little extra effort to balance the autoharp on the pouch. Fear not; see the tips further down this page for balancing ideas. Any leg shaping or other fancy cut-outs on the bottom of the tailpiece (illustrated in red above) can make the autoharp’s balance lean irreversibly on the button arm instead of towards the chin and the body’s center. Any extra decoration at the top that enlarges and/or reshapes the autoharp’s basic shape may cause the autoharp to lean into the button arm. Also, remember that what’s described here is a place to start. You may need to make further adjustments to find what works best for you. See Troubleshooting and Hip Pouch FAQs for more ideas. Fill the pouch with peanuts and zip the lid closed. Check that the lid is a little on the concave side, forming a shallow well for the autoharp to sit in securely. If the lid is level or bulges upward, take some peanuts out, zip the lid closed again and recheck. And if the well looks too deep, add a few more peanuts. Hold the ends of the belt by each closure half, then wrap the hip pouch’s belt around the widest part of your hips. Don’t fasten the closure or make any adjustments yet. Just wrap the belt snugly around your hips and hold that pose. Look at the ends of the belt. They either overlap, or don’t meet. Eyeball the amount of overlap or gap, mentally add another inch for the closure, then remove the pouch and shorten or lengthen the belt this amount. Put the hip pouch on and fasten the closure. The belt will feel too loose around you, but this is exactly what’s needed, especially for women. If you need to, raise the back half of the belt so it crosses the small of your back. The pouch will “sag” down low in front of you. This is fine. Sit on the front half of the chair or stool. Set your feet apart and heels under your knees for balance, also to set your lap level with the floor. If obtaining a level lap from here means setting your feet on tip-toes, you need a shorter chair or stool. 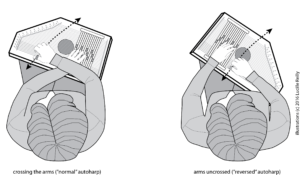 If you don’t have a shorter chair or stool, put a thick book under each foot to level your lap and release the tension in your feet (and the rest of your body). If you are tall and your lap slants towards you from knees to hips, put stacks of thick books or magazines under each chair leg, or try a piano bench, which is higher than regular chairs. Do not sit on a couch with spongy cushions, as this can throw off what will soon be the autoharp’s new relationship to your arms. Eyeball a place halfway between your left thigh and crotch, then center the pouch over this place. You may notice a large gap between the pouch and your front. This is fine; remember, the belt is supposed to be loose so the autoharp can stay on it. a. Hold the autoharp in front of you, a few inches above the pouch, string side facing away. b. Tilt the autoharp to set the lower treble corner at the bottom. c. Center the lower treble corner on the pouch lid against the center of the zipper tape. d. Rest the autoharp on your collarbone or upper bust. e. Let the autoharp tip towards your center, against the left side of your jaw (don’t try to rest it on your ear). The autoharp may go here automatically; if it does, great! Hopefully the autoharp is staying in place for you! If you feel it sliding off, or tipping very far sideways either way, see the next section. Your elbows will probably stick out more now that your arms are free of the autoharp; this is absolutely fine. (When jamming in a crowded space, sit a little sideways. Do the Hokey Pokey: “Put your right elbow in,….”) The new height will re-orient the angle of the button forearm and hand; the fingers will approach the buttons more perpendicularly than before. If you feel like the autoharp needs to be still higher to increase your playing comfort, certainly give it a try. Place a folded hand towel or similar between your thigh and the pouch (do not place the towel directly under the autoharp). Fold the hand towel different ways to increase the number of towel layers for a thicker piece. Viewing yourself from your left side in a mirror should show the autoharp slanting towards your left shoulder. The autoharp will not be dead vertical, and shouldn’t be (it’ll fall over!). A plus upon finding your optimum slant is that you will be able to see the autoharp’s strings in your peripheral vision. Slant may also make strumming and picking all of the strings easier, especially the high treble strings which are furthest away from the string hand. Note: It’s okay to find a reference point for yourself between the top bass corner of the autoharp and a place on your head (top of ear, eye, top of head, etc.). However, this reference point pertains to you only! The same reference point won’t work for all autoharpists, due to differing heights and arm lengths, so you can’t recommend your reference point to other autoharpists. A case in point: I once set up a 4’10” autoharpist with a hip pouch, and when all was said and done, the autoharp’s top bass corner hovered two inches above her head! Aligning it with the top of her ear, which works for me, would have set her autoharp too low to her arms. I hope you love the hip pouch set-up as much as I do! Let me know your thoughts, and maybe I will share them here. Be sure to see Hip Pouch FAQs, too! The belt is too tight. Loosen the belt an inch and try again. Repeat as necessary. Revisit step 1 in the Instructions above. The autoharp sits on the thigh inside the belt, instead of atop the pouch. The belt is too loose. The lap may be slanting downward (towards you) from the knees, caused by a chair/stool seat that is too low. The autoharp keeps sliding off the hip pouch. If the pouch lid is level or bulges upwards, remove some peanuts from the pouch. The lid needs to be concave, forming a shallow well. If the well is present, “massage” the pouch some to move the peanuts around inside. The belt may be too tight, setting the pouch too high at the waist. The chair/stool seat may be too high, slanting the lap enough to bring the hip pouch closer to the body. See the Materials section for more. The autoharp won’t lean towards the chin and body center after it’s set atop the pouch. Move the pouch (not the autoharp) a little to the right or left of where it is now (not quite centered on the left thigh). I have usually found that moving it a little to left seems to be the adjustment it needs, but if not, of course move it to the right. If the autoharp’s tailpiece is larger than usual to shape it for the leg, this can be the biggest reason the autoharp won’t balance towards your center. Test balance by removing the tailpiece. This often sets the balance aright, but it also exposes the delicate hitch pins, etc. The best solution for straightening the bottom side of a shaped tailpiece is to ship the tailpiece, not the entire autoharp, to the luthier who built it. (When holes are drilled through the tailpiece, they go through to the autoharp at the same time. The holes already in the tailpiece already match up so that you can screw the tailpiece on easily upon its return.) Ship the tailpiece when your autoharp can stay home for a while. While the tailpiece is away for re-shaping, store the autoharp in its case when not in use, covering its bottom with a hand towel folded once or twice lengthwise to protect exposed hitch pins, etc. Soft cases do not completely protect from hard bumps against furniture, doorways, etc., so transport the autoharp in its case very carefully when you have to. The bottom edge of the autoharp is extremely slanted. The angle formed at the lower treble corner is usually anywhere from 80-90 degrees. If it’s greater than 100 degrees, the autoharp’s balance shifts too far to the left and into the string arm (see the illustration in Materials), making the pouch option unusable. Examine the top of the autoharp for any decoration that makes it physically larger. Extra area here can prevent the autoharp from deciding which way to lean. Adjust placement of the lower treble corner on the pouch, moving it slightly left or right along the zipper tape. The autoharp feels too high when I play. Check for a level or almost level lap. A side view in a mirror tells all. The autoharp’s lower treble corner slides around on the lid. Cut a 4×4-inch piece of rubbery shelving material (found at most hardware stores), and lay it atop the pouch’s lid towards the zipper, then place the autoharp on the piece. Loosen the belt some and see if this helps. The autoharp won’t stay put no matter what you do. Take the hip pouch off, flip the pouch upside down and re-fasten the belt. Then park the autoharp on the bottom of the pouch. (This worked great for one of my B&B students, who swears by it.) While you’re at it, experiment with placing the autoharp atop the back or front of the pouch. The lower treble corner may be widely curved instead of pointed. The tailpiece end of the autoharp is angled very steeply to its sides. This tailpiece shape won’t stay on; sorry. The hip-pouch set-up is stable and comfortable, but your arms seem to be too short to surround the autoharp. Stop supporting the autoharp with your forearms. Let the hip pouch support it for you. Set your elbows ahead of your shoulders. This slants the upper arms forward, opening the arms wide to prove that they really are long enough when you bring them around the autoharp to play. Elbows that are next to the body can make us believe that our arms are “too short.” Then the hands wind up at right angles to the forearms, harboring big bends in the wrists that can cause pain while limited the number of strings that can be accessed. Where does Fabaceaen come from? 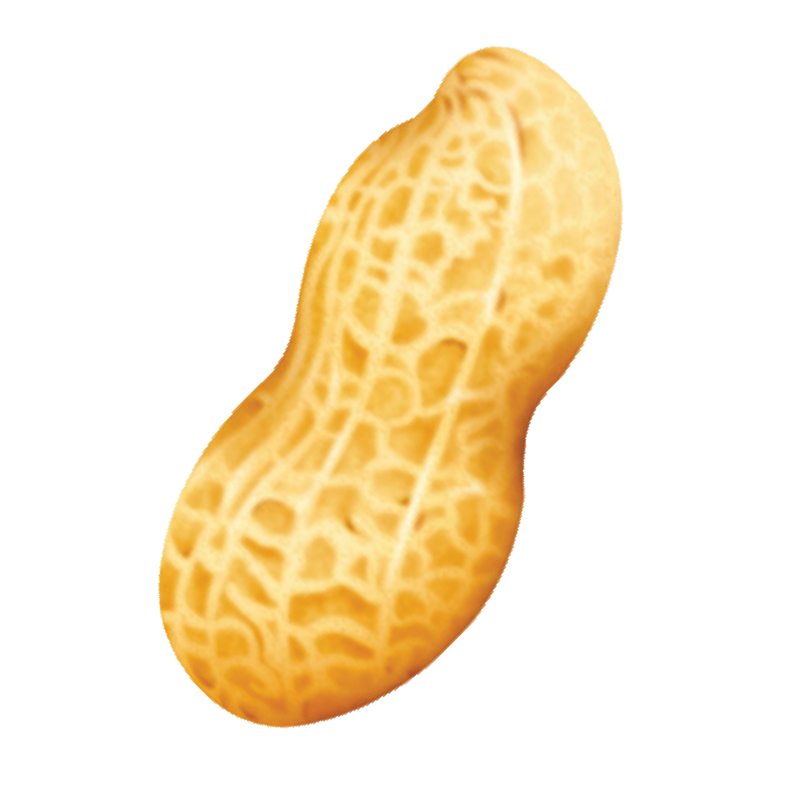 The peanut belongs to the botanical family Fabaceae, hence Fabaceaen. The peanut plant’s manner of growth is fascinating; click here to read all about it, and see a photo. (Once upon a time, peanuts were considered poisonous, until George Washington Carver popped some in his mouth, to the gasps of onlookers. Why is it called a hip pouch and not a f- – -y pack? The hip pouch doesn’t work for me. Is it hopeless? The most common issues that prevent the hip pouch from doing its job are wearing the pouch at the waist (loosen the belt) and too many peanuts in the pouch (take some out). Check both for yourself, and click here for more ideas. Also, be sure to review the set-up instructions from start to finish. My arms seem to be too short to play the autoharp. What can I do? Does the hip pouch’s belt have to be that loose? For most autoharpists, yes. Once I fasten the belt ends together, I can slip the belt down past my hips. However, someone with very wide hips may find that the belt needs to be a little shorter. A hip pouch worn by a woman up around the waist rests under the bust, where the autoharp’s lower treble corner can’t catch on the pouch lid. A loose belt clears the bustline so that the autoharp will stay put on the pouch. Still, feel free to experiment with belt length until you find what’s best for you and the autoharp. I bought a custom, wide-bodied autoharp (having 41 strings), whose body measures one inch wider than a 37-string autoharp. I am having trouble getting my left (button) arm around to reach and depress the chord-bar buttons comfortably. Can the hip pouch help? Yes! I am 5’4″ and had the same problem, but no more. When the hip pouch raises a wide-bodied autoharp, it “becomes skinnier” so that both arms can surround it with room to spare. The hip pouch also enables the right (string) hand to play the highest strings, furthest away from that hand, easily. It all depends on the player. Some feel immediate freedom and know they can use it right away, while others need more time. In all cases, players find the autoharp easier to play, even if it feels different. Give it a try! Is there anyone for whom a hip pouch truly does not work? Perhaps a very tall person, but I have yet to really know. Their very long arms may not require wearing a pouch. If you are a tall autoharpist, contact me and we will arrange a time, perhaps on webcam, to find out what happens. I will then report the findings here. Why do you fill the hip pouch with peanuts? Is it okay to have my wallet, etc., inside? I used my hip pouch originally for carrying personal items just like anyone else, but “wearing” the autoharp takes a consistent set-up on which to balance it for secure playing. What if I travelled to a gig and left my checkbook at home? The emptier pouch would be more flimsy and less supportive. So my hip pouch is dedicated solely to autoharp playing, eternally filled with lightweight yet firm peanuts in the shell. Can I use the hip pouch to play the autoharp standing up? As of August 1, 2016, the day after the 2016 Northwest Autoharp Gathering (not great timing, but word will get out), I can finally shout from the rooftops a resounding YES to this question! So far the autoharp maintains the same ergonomic set-up and slant when standing to play as for sitting. I still need to test the concept with various hip pouches in my stash to check for consistency and stability. Watch this page for more news and how-to. Do the peanuts make noise inside the pouch while you play the autoharp? Haven’t heard a thing, especially while recording my solo autoharp CD! And I haven’t heard any noise from the plastic sack they live in, either. Have you ever eaten the peanuts in your hip pouch? I could, but no. Whenever I fly to a gig, I usually pack the filled hip pouch in my checked luggage. I suppose I could remove some peanuts to pop in my mouth during the flight, but they are old and could be unappetizing at this point. Do you replace the peanuts in the pouch once they pass their expiration date? I don’t know when the peanuts expire because the packaging is long gone. I usually add a few peanuts to the pouch when the lid’s well becomes too deep. All peanuts, no matter when I put them in, stay inside. You won’t ingest them, so you may be okay. Try large legumes or sliced wine corks if peanuts remain a concern. 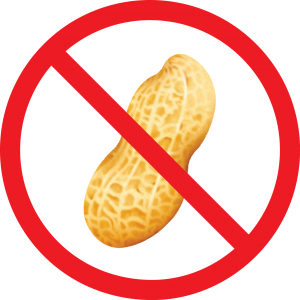 Those on low-sodium diets can use salted peanuts in the shell without incident. I play the autoharp flat on my lap, so I don’t need a hip pouch, but the Order sounds great! May I join? Angling the autoharp on your lap affords the same benefits as those experienced by autoharpists who play the Autoharp upright. The Grande Hippee’s Home for Wayward Hip Pouches got its start when two hip pouches were left behind on the Grande Hippee’s camping doorstep during two music festivals (one of them with two cute, stuffed animal toys inside, who have found happiness travelling with the GH to her gigs). While the GH is sad whenever a hip pouch is anonymously orphaned, she may also have reason for joy, realizing that some autoharpists own more than one hip pouch and want to share its benefits with others. Donated hip pouches, already filled with peanuts in the shell, travel with the GH to venues where autoharpists are known to show up. They are not sold for profit. She customizes the fit of each pouch to each autoharpist, and off they go to use it all festival long. The GH asks that each pouch be returned by the end of the festival so that yet more autoharpists may use them at another venue. The GH is also grateful for peanut donations, as dollar-a-bag sales do add up over time. To donate a hip pouch or peanuts to the Home, contact the Grande Hippee. Or just leave either item behind wherever she camps at a festival. This page was first published on September 23, 2016, and last edited on September 24, 2016.